I have just watched the BBC 2 Program This world on Closing Guantanamo, this can be found on BBC IPlayer here. The former Conservative defence secretary Michael Portillo investigates the response to President Obama announcement in his second day in office that he would close Guantanamo Bay within 12 months. A task which has ultimately proved unachievable within this time frame. Personally I’m not so sure this is achievable on any short term scale because of the politics. The most interesting aspect of this program was examining the balance between human rights and the security of the USA. Michael Portillo concluded that he would like to think that he would release the detainees. However after examining the political implications decided that he would have done the same thing as Obama. Which is release a few detainees and keep the others locked up indefinitely because you don’t have the evidence. Obama as a liberal minded man would naturally wish to release the detainees as there is not enough evidence to convict them. I also would being a liberal release the detainees and monitor those that appear to be a threat (wrong perhaps I know). But I can see Obama’s problem. The fact that Guantanamo Bay is helping to fuel the fire for terrorism but on the other hand if Obama released them and just one form detainee was involved in a terrorist attack in any capacity then this would be enough probably for him to be forced to resign. Not to mention the opposition in America to closing Guantanamo Bay. It’s all very well us Libertarians calling for a closure for the right reasons of Guantanamo. But unfortunately it’s worth remembering that we live in a realistic world, one where it’s hard to make the political decisions for the right reasons. Politics can have a way of forcing your hand into a decision that we do not like. This is because leaders can find themselves in a situation where political decisions will almost certainly come back to haunt you. The right reasons are not always politically acceptable. Please do watch this program (see here) and let me know what conclusion you would come too. 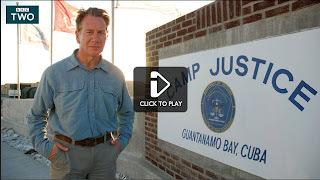 I’m writing to comment on the excellent programme by Michael Portillo about Guantanamo Bay. I think that he put forward a very interesting and objective viewpoint, putting all sides of the arguments as best he could. It makes you grateful that you are not a politician, doesn’t it? President Obama is in a difficult position: he came to office partly on a promise that he would abolish Guantanamo Bay and is now facing the prospect that he will not manage to close it down as quickly as he hoped. He is now realizing that there are a lot of other issues which perhaps he did not fully take into account before he became president. 3) to put on trial all of the detainees. The advantages of keeping it open is that it is a fully functioning newly refurbished prison fitted out at great expense to the American taxpayer and it is possibly keeping very dangerous terrorists out of action. The disadvantage is that by keeping it open, the United States is unable to criticise other harsh regimes which abuse human rights and the laws of natural justice. Keeping prisoners locked up for long periods of time without charge has always been regarded as contrary to the laws of natural justice. Just to close it would be an insult and an injury to those relatives of victims who died in terrorist attacks in particular the 9/11 atrocity in New York. It would also possibly let out very dangerous criminals. It will also let out of prison those who may not have been radical Muslims when they went into prison but many will certainly come out as radical terrorists keen to obtain retribution and revenge for being unlawfully locked up for many years. They could close the prison and put everyone on trial that this is also difficult because in many cases the do not simply have enough evidence to convince a Federal Court. Whilst they have enough evidence to convince a military court, they are unable to use evidence obtained by torture in a Federal Court. What is the best solution? Whatever it is done it is likely to be the best of a bad job. No one is likely to be happy with the outcome whichever option is chosen. In some cases it will not now be possible to release some of the detainees because there is nowhere for them to go and if they’re sent back to their own country they are likely to face death and torture. Thank goodness I am not President and it is not down to me to make these decisions difficult decisions. Yes Thank goodness I am not president because these decisions are very very difficult indeed. Agreed this is a tough call. In an ideal world it's one we would not have to make because we wouldn't have bellicose confrontational foreign policy replacing serious diplomacy or undermining the years of hard work cultivating trust to build relationships. But that's what polarised debate brings. Obama's got a lot of shovelling to do to keep all those idealists happy in the meantime while extra-constitutional rules are brought back within reason - it's simply not something which can be shut down like a light switch.